I am not the kind of man to despair easily, and I in my heart I knew the Elipsa had the potential to fulfill my ideal of the perfect domestic speaker. To love is to seek to understand the innermost secrets of the loved one, as Roland Barthes would have put it. So I sent another email to Paolo Tezzon reporting my findings and seeking guidance. He answered promptly by sending an electrical impedance vs. phase and an in-room full frequency response. The impedance plot shows the Elipsa to be a true 4 ohm nominal load. The impedance remains at 4 ohms for most of the audio band dropping below that at 25Hz, 75Hz and 750Hz, the phase angle being also higher at these frequencies. However the Elipsa is a very sensitive speaker and I never had the feeling the ARC Ref 110 was under any stress at normal to high listening levels. 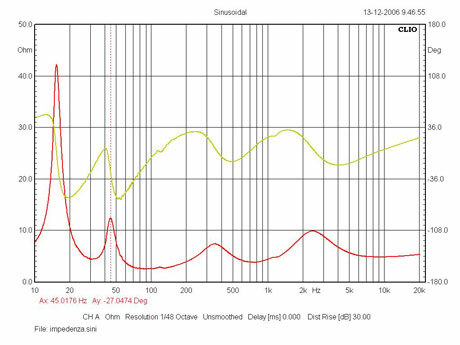 The response frequency graph was obtained in a non-acoustically treated room with the microphone placed on-axis at 1 meter between the tweeter and midrange. Other than the interaction with the room responsible for the saddle seen at 50-75Hz (probably the sum of the two lower ports output) above 100Hz the response is quite linear unless you want to nitpick. Further measurements in my room using a Radio Shack Digital Meter, which I hasten to admit is more a means to quantify what I hear than a reliable precision instrument, confirmed the existence of the aforementioned prominence in the bass although lower in range and level than the graph hinted (the frequency resonance of my treated room is 31.2 Hz) and a slight dip at the 250Hz crossover point, followed by a narrow peak of 3dB at 315Hz. The midrange from 400Hz to 800Hz is slightly suppressed. In practice this may account for the lack of chestiness in male voices, which is a good thing, and in no way made the Elipsa sound laid back or reticent, which is an even better thing. There was a mild suckout at the 2.5kHz crossover point which became more severe well above the tweeter axis followed by a rising trend from 3.5kHz up to a suspicious peak at 6kHz, the latter being the more objectionable to my ears at first, although as the test proceeded I found myself enjoying more and more the clean and grain free air around the high notes of female voices and instruments. I also detected a minor dip or lack of energy at 8kHz and from there upwards the treble response seems to extend into sweet infinity decaying at the pace of my own well preserved 56 years old auditory apparatus. Digital meter notwithstanding these 'measurements' must be taken with a pinch of salt for they are more of a subjective nature than scientifically meaningful in any way. If you are an objectivist you should stick to the response graph above or wait for a more technical analysis. But let me tell you now that 'technical tests' and graphs obtained by different magazines seldom coincide and are as prone to contradictory interpretations as subjective opinions based on listening tests. My experience with measurements at the anechoic chamber of the IST, in Lisbon, proved that you can alter any response graph by just moving the microphone less than an inch. Now add to the equation your own ears, system and room, listening disposition (and favourite records) and guess where it all leads to: either bliss or disaster. In the end it's the character of the speaker and how it interacts with your own audiophile personality in the context of the listening room that really counts. And the character of a speaker - like that of a child - can be moulded with careful upbringing. Paolo Tezzon was kind enough to reveal another secret of the Elipsa's sonic character. The crossover follows the Sonus Faber 'physiological' approach. In this case it's a mix of first and second order slopes. For example: although the bass to mid (low pass) crossover frequency of the woofer is set at 250Hz (12 db per octave) the midrange unit high pass cuts at 500Hz with a slow slope of 6dB octave, meaning that at 75Hz it is 15dB down. That's where the middle port (tuned to 75Hz) comes to the rescue filling the gap. 'It exists and I wanted it exactly to make voices sound the way I like. I also checked the narrow peak at 5/6kHz you mention and it is due to a higher sensitivity tweeter pair, yet well within driver tolerances'. And Paolo continues: 'the Elipsas should cross in a point 1 m in front of your listening position, this is the way I listen to them…'. The heavy toe-in as suggested above is indeed the best way to listen to the Elipsas in a larger room where you can place them well apart, although it is now becoming fashionable to place them so far apart, like Sumiko did at the Venetian, that the hole in the middle effect might lead to ectoplasmic center staged musicians. 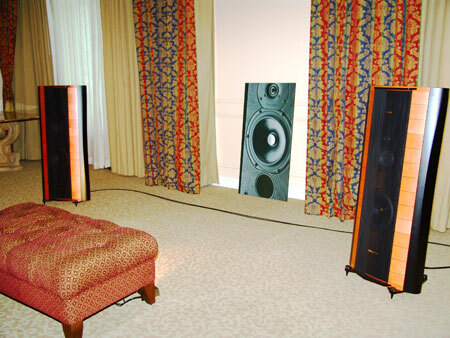 No matter how large the room, I don't think speakers should be placed much farther apart than 2 to 3 meters. In my narrow room toeing-in too much would be a clear overkill. With speakers placed closer together than the norm (remember I like listening in the near field) a full bodied and stable center stage is a 'sure thing'. For those of you who look at the Elipsas as a chance to buy a pair of “Strads” at half the price, two thirds the size and the same sound, if only just a little scaled down, I beg to differ. The Elipsas do not deny the Cremona heritage although they obviously profit from many of the technologies developed for the Stradivari project: the elliptical shape being the most obvious.Whenever I listen to the Elipsas, the words I more often associate with its sound are: fast, transparent, dynamic, open, clear, vivid. The Strads share many of the same virtues, but are of a darker, more refined persuasion. They are, one could almost say, Beethovenian in character while the Elipsas are lively, brisk, and alacritous like Mozart. Not that they will not play the Ninth at full throttle. Or Mahler's brass and bass conveyed anxieties. Or even blow you away with heavy metal, for that matter. It's just that the Elipsa bass is more agile, free from the gravitas, the weightiness and substance of the Strads double bass (and they look like one too). What we are facing here is the comparatively in room ponderousness of the Strads versus the light-footedness of the Elipsa single driver. Which brings us to another analogy: the double bass vs. the cello, which they vaguely resemble respectively, due to the size and blended curvature of the black hardwood sides. No doubt the Strads are luminous, as opposed to simply bright, and boast a delightful inner resolution while the Elipsas are more revealing, expressive, explicit, clear, and bold in the way they present music and ambience clues. Maybe too much so if one takes into account the buoyant performance of the ring radiator tweeter. Both grow on you but it takes some time to adjust to the fact that although they look alike they don't sound alike. I could resume my listening impressions by just saying the Elipsas sound younger and happier than the Strads. But not necessarily better, just different. 'The Stradivari sounded like a live performance in a real venue, filling the room with sound and doing the proverbial vanishing act. Maybe less so, because you just couldn't take your eyes off them! Given the larger than usual baffle, focus is not to the pin-point accuracy standard of, say, the Wilson Watt-Puppies (their natural competition in this price range), suggesting some attention to toe-in to further sweeten the spot. On the other hand I must confess I've never heard live pin-point focus, since the instruments and singers usually energize the air around them thus creating a bubble of sound not just an ideal point source. In this particular aspect of sound reproduction, the Stradivari is closer to reality'. At least in one occasion while listening at high levels I thought I heard a nasal 'shouty' or 'fluty' sound that I tentatively attributed to the upper port. I stuffed it with foam and the soundstage collapsed, images became flat and voices gained a pinched and artificial character as if I had put my hand over the nose of the singers. The Elipsas should be treated like a living creature: allow them space at the back to breathe and feed them only with the best amplification. And most of all give them love and care. They will reward you with a degree of craftsmanship and musicianship unheard of at this price (€13 500) in my long experience as a reviewer. I must confess I am an amateur reviewer. But mind you, etymologically, 'amateur' means: 'he who loves what he does'. It is because of the unique opportunities to listen to products like the Elipsa that I love what I do. I must congratulate Paolo Tezzon and Sonus Faber R&D team for their triumphant debut which constitutes another major sonic achievement for this prestigious Italian manufacturer based in Arcugnano (near Venice, where else?). Franco Serblin's legacy is in good hands. Ricardo Franassovici had warned me that I should wait for the ARC Reference 3 before jumping to any definitive conclusions about the Elipsas. My God!, was he right as always? The Reference 3 preamplifier has finally arrived at my listening studio. It was brand new, so I had to 'cook it up' a little for a few days. Although I still think the first impression is always the most endearing and reliable, there are a few items that take some time to settle down and can make quite a difference in music reproduction. I had already noticed, as it was expected, that the Elipsas were growing more mature tonally as time went by. Fine instruments benefit from being played. And yet, nothing had prepared me for what the ARC REF3 could do to the overall sound quality of the Elipsas. The McIntosh C2200 is no slouch, mind you! But the REF3 is indeed in a special league of its own. Who said that in a digital world preamplifiers are expendable? 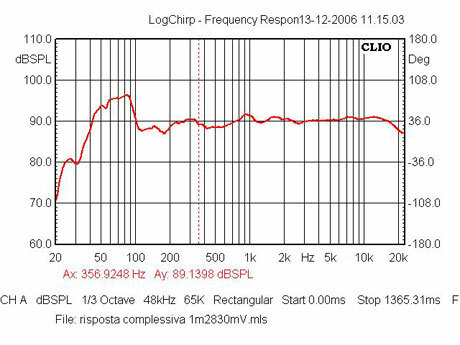 I do not agree the REF3 is the world leader in ambience retrieval and high frequency detail. Even the modest Prima Luna Dialogue Two allows me to follow the decay and electronically enhanced reverberance tail that follows some final syllables sung…eh…uttered by, say, Jay Leonhardt in Salamander Pie /SACD. Neither do I agree with words like crystalline, pristine, or even clarity as used my some fellow critics to describe the REF 3 performance. It is not a matter of more information, it is rather a matter of better information, the one that really counts: perfect timing is everything when it comes to recreate space, without it ambience clues will only clutter music with bustling sonic garbage. Do not give me detail, just give me the truth. Had I followed Ricardo's advice and I might have not been so picky about the treble presentation of the Elipsas, which seems now to have lost its former whitish character, showing more substance and better integration. I admit the ARC REF 3/110 duo does have a softer bass than its top solid state contenders. But I have never experienced such an illusion of listening to live music - any kind of live music, as a matter of fact, be it plugged or unplugged -, provided you use the system fully balanced. The ARC REF3/110 music reproduction is uncanny in its truthfulness. It breathes like a cosmic being, the ebb and flow of dynamics being so natural they remind me of the sea at Guincho Beach (Ricardo will know what I mean…): soothing, yet invigorating, a sensation that will replenish your weary soul for hours, tempting you to come back for more when it eventually fades away.